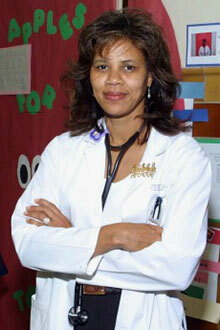 Veda Johnson, associate professor of pediatrics at Emory School of Medicine and director of the Pediatric Urban Health Program. Researchers from Emory University's School of Medicine and the Rollins School of Public Health received a five-year $1 million award from the National Institute of Minority Health and Health Disparities (NIMHHD) to evaluate school-based health centers in Georgia. The NIMHHD is part of the National Institutes of Health. Directed by Veda Johnson, MD, the Urban Health Program of Emory University's Department of Pediatrics was created in 2009 to expand school-based health centers throughout the state with the intent of increasing access to healthcare, improving health outcomes and reducing health disparities for underserved children and adolescents served by these centers. As a result of their efforts, five new school-based centers have been established in Georgia. "All school–based health centers are located in areas that serve lower income children," says Johnson. "A primary focus of our project is to examine the effects of expanding school-based health centers across several rural and urban sites in Georgia. We hope to determine the effects of expanding these centers on decreasing disparities in health and disease and related health care costs across rural/urban and minority groups of children." Johnson and Carol Hogue, PhD, the Jules and Uldeen Terry Professor of Maternal and Child Health at the Rollins School of Public Health, lead the team that will evaluate the school and health records of 1500 students enrolled in three of the school-based health centers throughout Georgia. The schools participating in this project are Turner (Dougherty County), Tiger Creek (Catoosa County), and Lake Forest (Fulton County).The goal of the evaluation is to measure the effects of school-based health centers on the improvement of school attendance, prevention and reduction of childhood obesity, reduction of emergency room visits, asthma management, and overall healthy lifestyles. "We believe that school-based health centers will help to establish a system of care that eliminates all barriers to health care such as cost, hours of operation, transportation and others," explains Hogue. "This system will provide services in the context of everything that affects the lives of these children and adolescents and hopefully provide an efficient model of pediatric health care that reduces costs for the state's Medicaid and SCHIP programs as well as for private insurers."